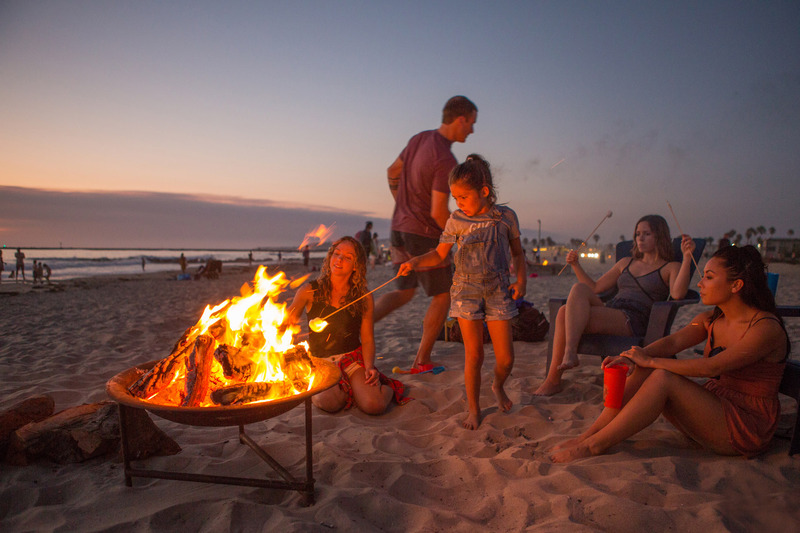 Slip into a truly San Diego experience and watch the sunset from Ocean Beach with friends and family by the glow of a fire. Fire set-up and tear-down provided on a number of San Diego beaches by The San Diego Beach Fire Guy (http://beachfireguy.com). The set up includes chairs, smores and tiki lamps, too. Model-released as a group: Hannah Ryan (blonde woman with black bikini and in some frames, plaid shirt around waist); Alicia Huff (brunette woman with coral top); Chris Huff (man with beard wearing short-sleeve navy shirt); Mitchell Sams (man with short hair wearing maroon/purple shirt); Tucker Fahling (blonde man in red shirt and baseball cap); Erin Halloran (brunette wearing fine-striped black and white top); Bella Halloran (young girl in jeans overall cut-offs).